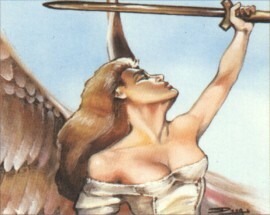 Serra Angel, accept no substitutes. 14:6 Saying with a loud voice, Fear God, and give glory to Him; for the hour of His judgment is come: and worship Him that made heaven, and earth, and the sea, and the fountains of waters. Tropes about the biblical divine messengers, and beings based off them. When their leader is a good deity, so are they. The story doesn't make it clear if a character is an angel. Angels portrayed as eldritch abominations. Extra terrestrials with angelic traits. Sometimes the trope is literal. Changing to or from an angel form. The angels Micheal, Lucifer, and Cthulhu. If angels appear on Earth, they're wearing overcoats. This biblical figure showing up in fiction. Angels as a miltary force. A devil goes good, and becomes an angel. The top brass in Heaven, answerable only to one deity. A group of angels are running Heaven. Death can be a benevolent figure, especially when an angel is assigned that role. Whether to Earth, or Hell, that angel is cast out from Heaven. Feathers symbols can also represent angels. When works assign gender roles to these sides. When you have a moral conflict, they appear on your shoulders to argue each side. You can tell the angels from the devils by these. The Archangel Azrael is the angel of death. A personal angel to help you in certain ways. Angels are often depicted with these. One of the most iconic aspects of modern angels is a floating circlet. People with halos and wings are just one of many ways to show an angel. In anime, an angel will shed lots of feathers, just because of Rule of Cool. Lucifer is the original fallen angel. Modern angels are usually depicted this way. When dying, a soul looks like an angel, ascending to heaven.